If you wanted to take advantage of an ATM, you might equip it with a skimmer, a device which captures electronic information from people’s cards and uses it to siphon away money. Two thieves in Pennsylvania, however, decided to go another route and rip the whole damn machine out instead. The New York Times reports that the masked—and, honestly, pretty ballsy—thieves used “a stolen dump truck, a long cable, and a chain” to do their bidding. The ATM reportedly had about $14,000 inside when it was ripped from its cozy home inside a ShopRite vestibule in Covington Township on Tuesday morning. The truck, which was stolen from a local country club, was found later that day along with “part of the machine.” (Rest in peace, buddy.) 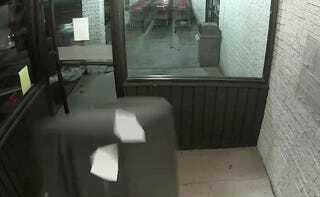 As of Thursday, the cash was still missing, and the thieves were still on the loose. Well, that’s one way to get some cash. I, for one, look forward to the thieves’ next stunt.